Mariposa's Tales MARIPOSA'S TALES: I Conquered 2009! I got an award from Nancy at More Than Conquerors! What a nice way to start a year. WOOT! Yay, I did conquer 2009 with grace! At least that is how I'd like to think. ;) I'm sharing this award to everyone. Obviously we did all conquer 2009 to make it here now! And here is my first Unconscious Mutterings for 2010! 365 :: 365 days of joy and laughter! Tombstone :: R. I. P.
Dumb :: ... and Dumber! Intrusive :: This annoys me alot! Shopkeeper :: ...at the bookstore. Love, LOVE your tombstone association. Great award...I'm grabbing this one for my blog for the very first one this year....thanks!!!! Hah, we matched on #3! Happy mutterings and Sunday to you. What a great award. 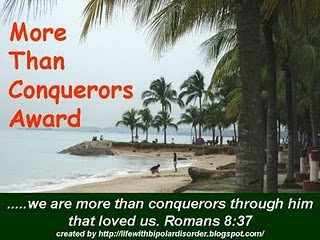 Conquering with grace is a great accomplishment. Ah, planned vacation rather than the childbirth ones - good! - I should have come up with year planner considering what I've just got around to adding to the wall!